This is the present top of the range ECU in the ‘traditional’ Megasquirt range. It has 8 fuel and 8 logic spark outputs offering full sequential fuel and spark for hi-z injectors and logic level coil-on-plug coils (or high-current coils with suitable external ignition module.) This supports full-sequential on a V8 or semi-sequential with wasted spark on a V12. Spark and fuel are fully trim-able per channel and injector timing is mappable for optimum power (~1% gain available) Six relay or solenoid outputs for nitrous, boost, fan control, shift light, tachometer outputs etc. Switch inputs for launch, idle-up, nitrous-in etc. and additional sensor inputs for external MAP sensors or measuring pre/post intercooler etc. 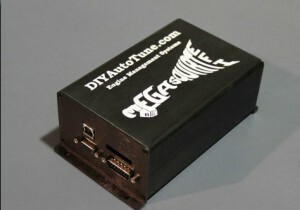 On-board SD-card datalogging allows fast datalogging without the need for a laptop while logging. Built-in USB-serial adapter eases connection to modern laptops. CAN communication ability to interface with extender boards for more inputs and outputs on the more complex installs – e.g. multiple EGT, multiple widebands, speed sensors etc. Calibration to adapt to OEM temperature sensors is straightforward and numerous wideband calibrations are supported.